oooh totally delish,sweetie, love the colours and the image is too cute! I am a DT for Penny Black Challenge .. Happy Bee Day Blog Hop Day 2| Honey Bee Stamps 4th anniversary + Giveaway! An oldie but a Goodie! STAMPlorations Spotlight - A vibrant trio of cards! Just Add Ink #453...Choose Two! La-La Land Crafts April Release Good Vibes Only! Last Chance Products from Stampin’ Up! 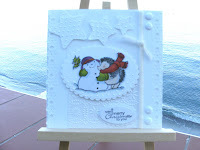 Christmas Card Club Challenge #8- Christmas or Winter Scene. Favourite Colouring Medium at As You Like It. Christmas Card Club - "Trees"
Newton's Nook Designs DT farewell + personal update! LESS IS MORE - FRENCH! I Have been Showcased Thanks !!!! !